With so many projects of late either failing, partially failing or coming in way over budget, those of us in the business of managing projects are concerned, and rightly so. 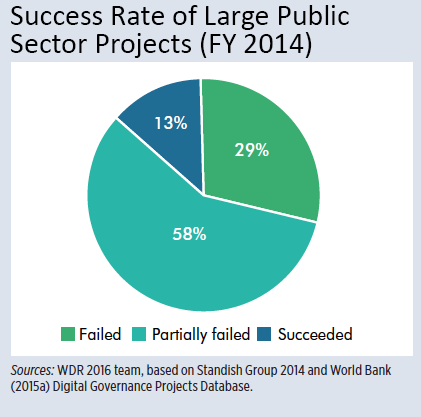 The reason for project failures and cost bloats are many fold, and this article only covers one problem that falls under the category of resource management - future posts here will cover other reasons, such as problems in task, cost and collaboration management. 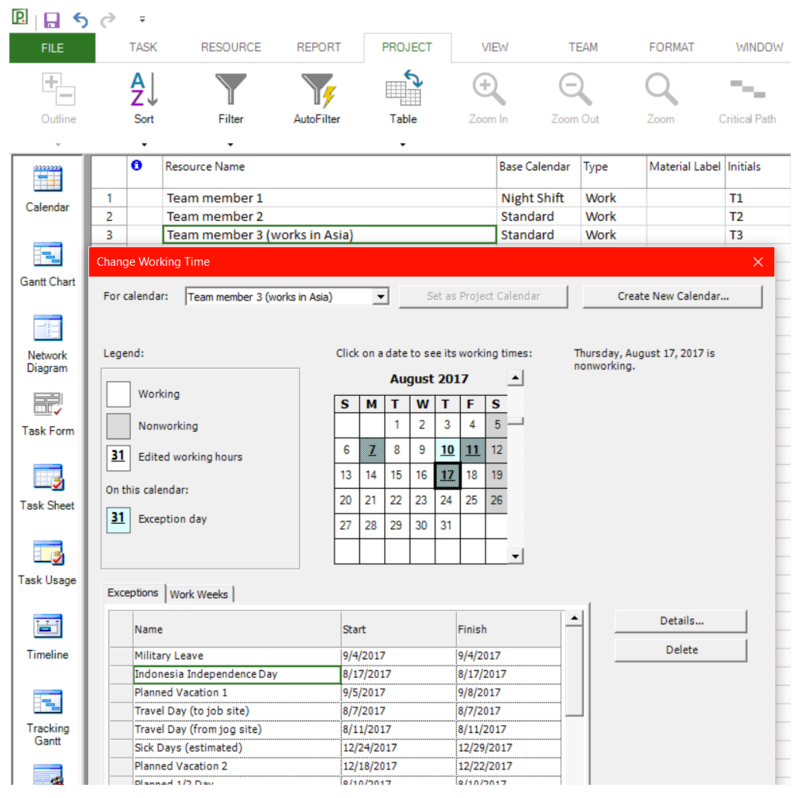 While proper calendaring is just one important aspect of resource management, it is often forgotten about amid the furry of rapid project design and implementation. In our rush to meet project-design deadlines, our up front estimates for human or material resources are often more vague than accurate, and this lack of precision often proves detrimental later on down the project road. So let's take a look at just how that dynamic works (imprecise calendaring), or in this case, doesn't work to the benefit of project outcomes. Proper calendaring (or in other words, knowing when your workforce is available for work) is important during all phases of project management, from the initial proposal & budget work-up, to the final analysis conducted once the project is complete. While your organization may have a standard working calendar (start/end times, company days off, corporate holidays, etc. ), it’s important to realize that individuals - and even materials - can have unique calendars that will deviate from the standard one used by your organization, and if not taken into consideration, can skew any plan calculations significantly. 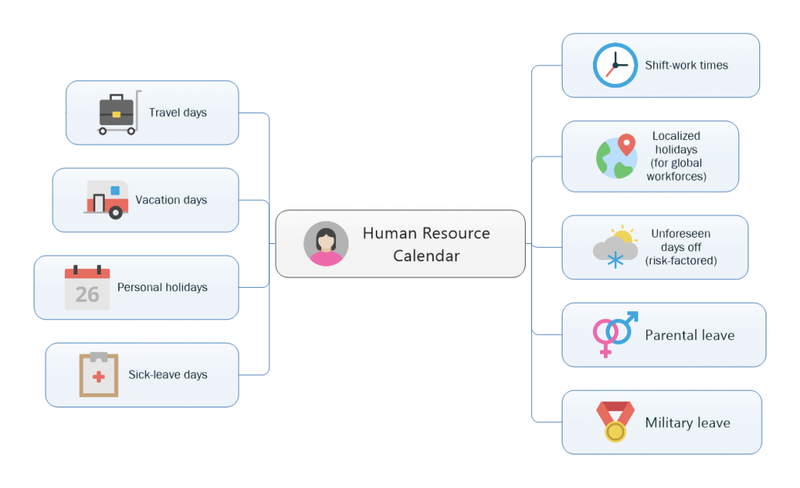 So let's first look at the relationship between a human resource, and their related calendar data points. Figure 1 shows the many related data points for any given human resource. In addition to these human resource calendar deviations, even materials can be considered to have their own calendar data points - see Figure 2. Although with specific materials, you usually have them or not, but machines that use material resources can certainly be thought of as having a calendar with data points. These points of concern (shift-work times, special leaves and holidays, etc.) are all factors that affect the bottom line, in terms of workforce availability, project costs and length of task durations. One must look at all of these points combined to get a more complete picture of your project's scope. So when preparing a proposal for any project, instead of picking a number out of a hat (for resource costs) or relying on an enterprises standard 8-hour / 5-day work week, you can use the above data points to get an much better estimate all of these data points are factored in. One common example of an error during this phase, is when a globalized company uses a standard US calendar for work being performed in Asia, where workers may be using a 10-hour / 6-day workweek - see Figure 3. But regardless of location, if these often forgotten factors are not considered, you might be proposing a planned budget and schedule that can never be met. When scheduling the work, unless precise calendaring is used that takes into account all possible calendaring points, planned schedules will most likely be shorter than the actual outcome, and cause your project to have needless cost overruns and delays. When evaluating project performance during the post-mortem, the results will be skewed by the initial errors in calendaring, and that will not be helpful when repurposing previous project data in order to project costs and schedules for the next like-project coming down the road. So, in this post we have 1) explored the importance of calendaring across all phases of project planning, 2) shown how a single resource has many calendar data points, and 3) been given a simple procedure for getting a handle on your project's workforce availability (and how that affects project scope). The benefit of proper calendaring should become evident in your next project that takes this knowledge into consideration, so give that a try – since as they say - the proof is in the pudding! Watch this space for future posts that will help ensure that your project is successful, and never placed into the category of "failed" or "partially failed."